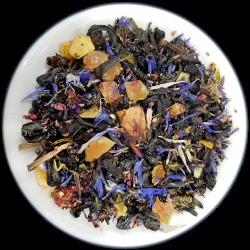 Meet our new super tea - a blend starring Kenyan Purple Tea. Purple tea offers low caffeine, and 15 times the anthocyanins (a super-antioxidant often cited for its health benefits) of blueberries. It's a great way to help your body boost antioxidant defenses, and reverse the damage caused by free radicals.